The factory running rigging on most small sailboats, including the Catalina 22, is minimal to keep the price low. That is, the halyards and any other control lines are only long enough to fasten them to nearby cleats. Convenience and trimming for performance are a luxury reserved for larger, more expensive sailboats. It works okay, but it makes having a crew more of a necessity and it’s not ideal in heavy winds when getting out of the cockpit can be unsafe. For safety and to add more control lines, such as a headsail downhaul, single-line reefing, and boom downhaul without requiring more trips forward, the solution is to lead the lines aft to the cockpit. It’s also a good idea if you ever want to sail single-handed or race competitively. The biggest issue with leading the lines aft on a C-22 is the question of where to run the lines aft over the cabin roof. There’s very little room on the first generation design with a pop top. The handrail takes up much of the width of the available space and leaves only about enough room for two lines, one on either side of the handrails. Models without a pop top leave more room to work with. The problem is worsened by the curvature of the pop top and the handrail that makes guiding the lines through fairleads almost a necessity. Some owners run the lines on top of the pop top where there’s more space, but that’s not a good solution. For starters, it makes raising the pop top even more difficult due to its interference with the lines. Second, the pop top isn’t a very strong structure on which to mount the deck organizers and cleats. It’s held in place with the two loose-fitting, hand-tightened hatch dog bolts. 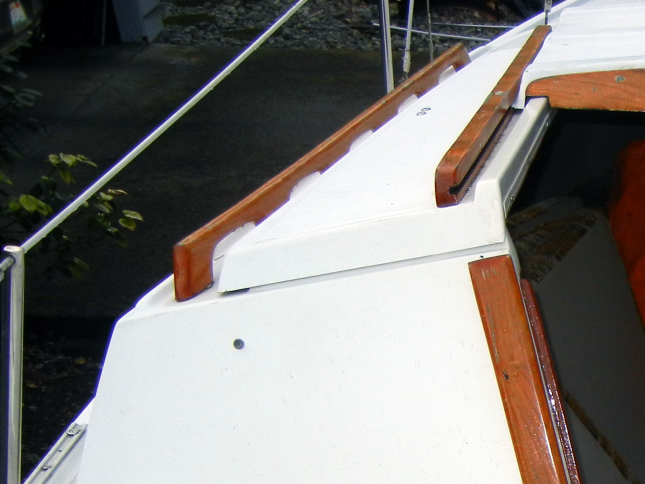 One practical solutions is to keep the lines on the cabin roof but to remove the handrails to make more room for them. I’ve rigged Summer Dance this way and after several years, I haven’t missed the handrails. They’re generally too low to be very useful anyway. The first piece of hardware that you need to lead your halyards and other lines aft is a halyard plate under the mast step. A popular online Catalina parts retailer sells a mast step halyard plate that is the best choice for C-22s although Garhauer Marine sells universal models. A halyard plate has holes in its edges where you can attach blocks to turn the lines outboard from the mast toward deck organizers. It’s easy to install and requires no hole drilling. Just unstep your mast, remove the mast step, and place the halyard plate under the mast step before you replace it. Be sure to seal around the roof penetrations here and under all hardware that you install with butyl tape or another premium sealant. 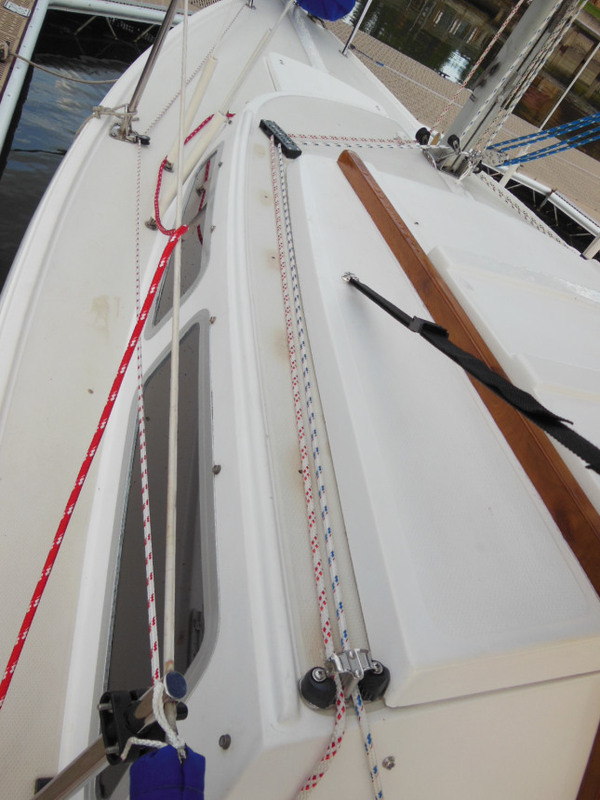 Deck organizers are sets of sheaves mounted on the forward corners of the cabin roof that turn the lines coming from the halyard plate aft toward cleats or clutches at the cabin bulkhead. These are the next pieces of new hardware that you might need. You should have at least one sheave for every line that you are leading aft. I prefer Harken 38mm triple sheave deck organizers rather than the dual sheave ones from that popular online Catalina parts retailer that are typical on C-22s. 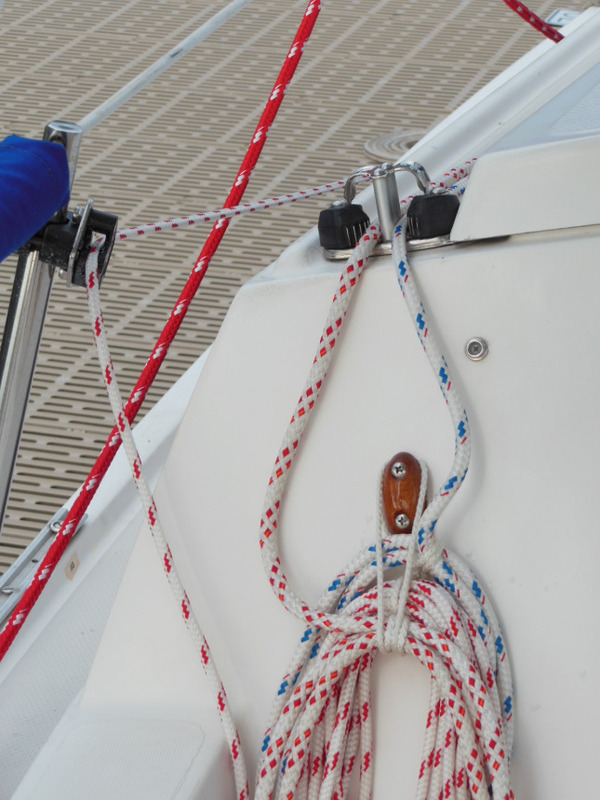 Dual sheave deck organizers can limit your rigging options. Triple sheave organizers give you more options for whatever you decide to add in the future, for example, a cruising spinnaker. I use all six sheaves on Summer Dance. Installing deck organizers can be a little tricky. 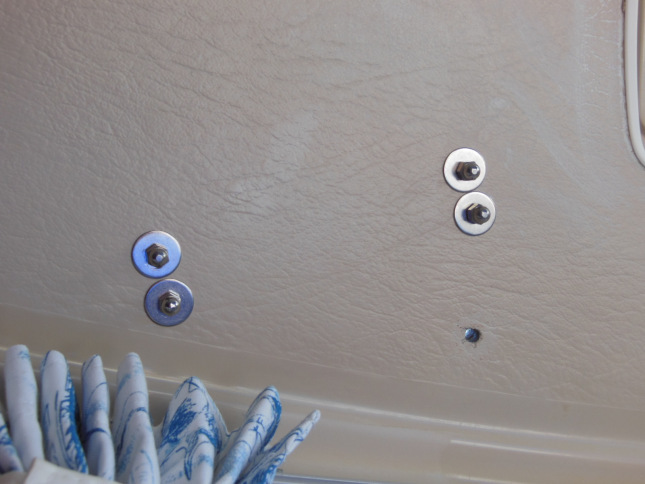 Their placement and the fasteners that you use are important. The organizers need to be angled so that the lines exiting the organizers are the right distance apart to fit in the space that you have to run them to the bulkhead cleats or clutches. Angle them too much and the lines can chafe against themselves or on the edges of the organizers. Don’t angle them enough, and the lines can rub against the pop top or the roof gutter. The organizers should also be as far aft on the deck from the halyard plate as possible to increase the angle of the lines going through the organizers. That will lower the friction added by the deck organizers. A tip that I use is double-sided carpet tape to stick them to the deck and experiment with different placements to find the best location before mounting them permanently. Use 3-1/2″ through-bolts, fender washers, and lock nuts (or lock washers and acorn nuts), not wood screws to mount the deck organizers and cleats or clutches. They will be under a lot of force from the lines running through them and the hollow core roof is not strong enough to hold the force otherwise. For a tip on drilling accurate holes through the roof so that there is equal space on the underside for the fender washers, see Accurate hole drilling. The last issue to resolve for this project is which cam cleats or clutches to install on the cabin roof. Most C-22’s that I’ve seen have some combination of cam cleats, clam cleats, or clutches installed on the roof or over the edge of the roof on the top of the bulkhead. The problem again is, the handrails take up too much space. Some C-22 owners solve this problem by trimming off the last loop of the handrails. Without shortening the handrails, there isn’t enough room on the roof at the bulkhead to mount cam cleats or clutches and barely enough room for clam cleats, which are harder to adjust. But if you remove the handrails completely, you have more options. To fit three lines and cleats or clutches on each side of the roof, you have to get creative. My solution was to install one dual cam cleat on each side of the roof. Each takes less width than two single cam cleats. I did need to grind a little relief in the pop top edge for the cams but it’s not noticeable. I use the cam cleats for the lines with the highest tension on them. 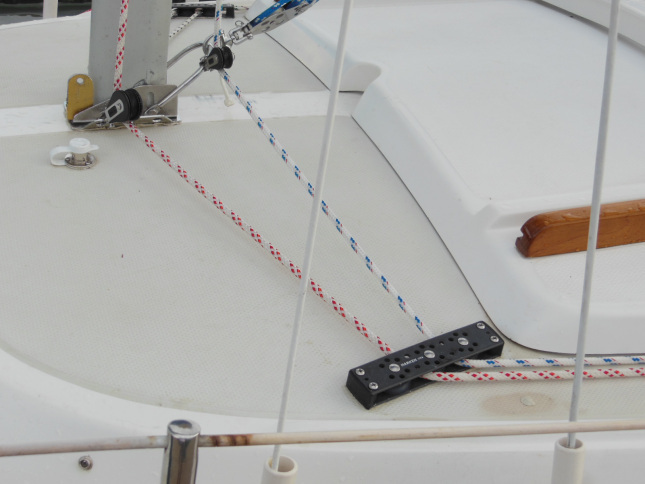 For additional lines that need almost no tension (for example, a headsail downhaul), you can mount a clam cleat on a nearby stanchion as shown below. Other options are a regular clam cleat on the roof slightly forward of the dual cam cleat or a lateral clam cleat mounted vertically on the upper corner of the cabin wall. In my opinion, line clutches aren’t as practical as cam cleats. Clutches were designed to work with cabin top winches. They require one hand to pull or winch the line and the other to operate the clutch. Cam cleats let you keep both hands on the line and pull harder, eliminating the need for cabin top winches and saving time. The last part of this project is all new lines. I’ve compared prices from several eBay sellers with the 20% discount that West Marine sometimes offers. The best bargain, however, is when West Marine features bulk rope in their holiday and random Fantastic Friday sales at 40% off. That beats all other online prices. Following is a table of the line sizes that are plenty long enough to lead aft where applicable and for splicing eyes if you choose to do so. If you look closely at the table above, you might be curious about the 8mm halyards. I prefer the larger diameter for a better grip, which lets me get the halyards tighter without resorting to cabin top winches. For external halyards, 8mm is larger than the standard equipment 1/4″ masthead sheaves. They will fit in internal halyard sheaves, by the way. If you don’t have internal halyards, you can install Oversize masthead sheaves. To finish this project, I recommend that you learn how to splice eyes in double braid line. I use them everywhere I would normally tie a bowline knot except at the traveler dead ends. Knots let the car travel farther there. I whiplock all the other ends to prevent fraying. To help organize the lines at the bulkhead, you can install sheet bags or line hangers like shown here. Taking the easy route and buying kits is convenient but expensive. Besides, kits seldom have all of the features that you might want. Stingy sailors seldom take the easy route. You can easily purchase all of the parts that you need for this project online. For your hardware needs, consider using the $tingy Sailor 10% discount from Viadana USA. Your new rigging will work great and really add to your sailing enjoyment. Personally, I can do almost everything from the cockpit now and there’s no excuse for not trimming the sails properly. It looks sharp, is organized, and helps immensely when sailing single-handed, especially when racing. I’m a big fan of your site… and diy philosophy. I recently followed your lead and took advantage of West Marine’s recent sale on new 8mm VPC for my halyards and 5/16 Sta-Set for my sheets (for both my jib and main) for my ’86 Catalina 22. I want to use eye splices rather than knots for those lines… mainly coz I prefer that look… and I like learning new/useful skills. In your NE Ropes posting, you said you taught yourself how to do these splices. So… I was wondering if you’d mind sharing your main sources and any useful tips for learning to how create eye splices in VPC and Sta-Set — specifically looking for links to books/websites/videos/pdf’s etc. I’m really glad you’re finding this blog useful. It’s for guys like you that I write it! Splices really do look better than knots everywhere making the boat look like it’s simply tied together. I find that they make things easier to work with too, without knots getting in the way. And I trust their strength. I know the bowline is strong, I trust it with my life when rock climbing. But a good splice is hard to beat. In a prior career, I used to splice 5/8″ steel cable end to end on occasion and I’ve seen those splices outlive the surrounding cable. So it was with more than casual curiosity that I learned to splice braided yacht rope. I got the most out of the New England Ropes Splicing Guide, the Andy Wall video, and the Annapolis Performance Sailing whip locking video. Those resources and one practice splice, and I was splicing everything in sight. * With the double braid eye splice, it’s not critical which you bury first, the core or the cover. You’ll wind up doing both, but memorize it one way or the other, whichever you prefer and do it that way every time and you’ll get faster at it. * The core to core splice in VPC is a little tougher but stick with it and you’ll get it. * What I found works best for the final pull is to hook your slip knot to a rafter or ceiling joist (in the garage. The wife might not appreciate it in the family room), hook some webbing loops through the new eye to make a crude climbing type harness, and hang or drop your weight on the splice. Much easier on the joints, easier, and faster. * I did all my splices without commercially made fids. In true DIY fashion, I made a makeshift fid out of a rain gutter spike and just taped the rope to it with painter’s tape. That and an awl for pulling out strands, and the other tools like scissors, etc. worked fine for me. It’s more about the technique and attention to the details than the tools. * Do mark your eyes a little larger than you want them to wind up. They’ll come out smaller, in my experience. * Unless you already have old sailor’s hands, wear clean, non-marking gloves when milking the cover or you wind up with lots of blisters. Hanging on the eye helps a lot with this one. * Don’t skip the end whipping step. It’s an equally valuable skill. Good luck with the splices and have fun with it! If any other questions come to you, feel free to ask here. The 40% off Bulk Rope Sale @ West Marine for 2015 is one day only, tomorrow (Friday May 22)! Have there been any recent changes as far as the lengths or additional lines to the list above? Also, in case I missed it another post, what was your approach to choosing the color scheme of the lines? I’m planning to print this list to use for shopping tomorrow! Thanks for all your priceless info provided in your blog posts! Those lengths are still valid for my rigging. If anything, they are a few feet too long in some cases. Depending on how yours is rigged, you may have more or less extra length than I do. But none of those lengths are too short. For example, the length shown for the vang is enough to lead from the mast base to an organizer and back to the cockpit. I usually just leave the extra hanked and laying on the companionway hatch. The foresail downhaul length is enough to route it various ways at the toerail or straight back over the cabin. The mainsail sheet is long enough to connect between the stem fitting and the forestay to use for stepping the mast. The foresail sheet is a single piece long enough to cross-sheet a 110 jib. And so on. The only lines I haven’t listed there yet are the spinnaker halyard and sheet, which will be in an upcoming article on rigging for a cruising spinnaker pay-as-you-go style. That is, flying a spinnaker with no new rigging and adding rigging as your budget allows. My color scheme is described in Running rigging color scheme. How did you find out about the sale? A WM employee tipped me off last year. I get emails about upcoming sales because I have a West Advantage membership. It’s a free membership like any other retail ‘points’ deal. I’m already a member but I apparently opted out of the emails at some point. Glad you mentioned the sale, I’ve been watching for that all year! Glad I could help by giving you a heads up… Also, all the sale prices of other items are extended through Memorial Day Weekend, so I might get some Taylor fenders along with my running rigging! Stingy – how did you settle on the Harken 271s? And have you been happy with them thus far? I’m probably going to replace my double organizers with triples when I rebed my deck hardware (and replace the jam cleats with clutches so my kids can manage cleating and uncleating lines). I wasn’t looking for any particular brand, but the pair of them came up for auction on eBay at a price I couldn’t pass up. I’ve been very happy with them so far, haven’t given me a bit of trouble. When I added my spinnaker rigging (see How to rig a cruising spinnaker in 4 stingy stages), I was really glad that I had a third sheave. Take a look at the new Spinlock asymmetrical triples. The measurements suggest they will be a good fit, and the price is great even if ordering from Spinlock direct or West Marine. I have a set of Garhauer Stainless triples and they are too big to make a fair lead. Those do look like they would work well and at a reasonable price. The Garhauer mast bail is part of my boom vang setup. I purchased it direct from them at the link in that post. Thank you so much for your posts! Sorry I’m late to the game but I’m redoing a 1980 C22. Which size turning block did you use? Is it a fixed or swivel? Again, thank you so much for your articles!! I use 39mm universal (swivel) turning blocks. Different manufacturers have slightly different dimensions (+/- 1-2mm) in that size. You want them to be at least as large as the sheaves in your deck organizers. The smaller the diameter, the more friction and the harder the lines would be to harden. You can go larger (57mm) but depending on how many turning blocks you will have and how they are attached, they could interfere with one another if that large. These are some of the greatest real , useable plans out there! I greatly value your work! Although my vessel is a1960 Herreshoff I have found almost everything you have done to be of some appreciable merit to me on my Good Ol boat. Is there a systematic way to lay the lines, like foresail to port and main to starboard, and halyards closest to the centerline of the deck? Do you label them, or just remember the color scheme? This puts #1 through a fairlead cleat outboard and forward of my port side double cam cleat, which works fine since that line seldom gets trimmed while under sail and it isn’t subject to much load. And it put #7 in the starboard fairlead cleat since it too is mostly set it and forget it and not much load. The other four lines on the bulkhead handle bigger loads and get trimmed more often, and the cam cleats work well for them. The foresail and spinnaker sheets are on the winches to either side of me so the only lines behind me are the traveler and backstay. I do have Dymo labels on the bulkhead mostly for the benefit of crew members who aren’t familiar with my boat. I’ve also found that it helps to put labels near the mast turning blocks to help me remember the right order to lead the lines when I’m setting up again after unstepping the mast. The color scheme that I described in Choose Your Running Rigging Colors Logically also helps. I need to replace the wooden rubbing strafe on my boat (Shipman 28) as they are past sell by date and not refurbishable, have you any suggestions of suitable replacement, maybe one of the composite moulded materials .? I assume you mean the trim around the top of your cockpit and gunwales. Some skippers replace their worn out teak with white King Starboard but since the teak is such a distinctive feature of your sailboat, I’d recommend sticking with something that looks like teak such as one of the synthetic materials described in this article in SAIL magazine.